What Bauhaus is to Tel Aviv and the Garden City to the Rehavia neighborhood in Jerusalem, it turns out that Beersheba is a world capital of Brutalist Architecture. From the French béton brut (raw concrete), Brutalism refers to a rough unadorned building style popular in the 1950s, particularly by state and public institutions. It was precisely at that time that modern Beersheba was built up rather quickly around what was left of the Ottomon-Bedouin parts of the old city that were cleared out during the War of Independence, a chapter in the Palestinian Nakba. Beersheba was turned into something like a state funded design lab for principles of new construction and modern urban design. You can read more here. The Beersheba structures might not be the finest paragons of the art of Brutalist architecture, but what Beersheba Brutalism may lack in sheer quality is the more public, i.e. extensive spread of the style throughout the city’s early urban fabric. In other words, Brutalism makes up part of the architectural vernacular in ways that might make this long neglected city actually unique as a site in the history of mid-century modern style. 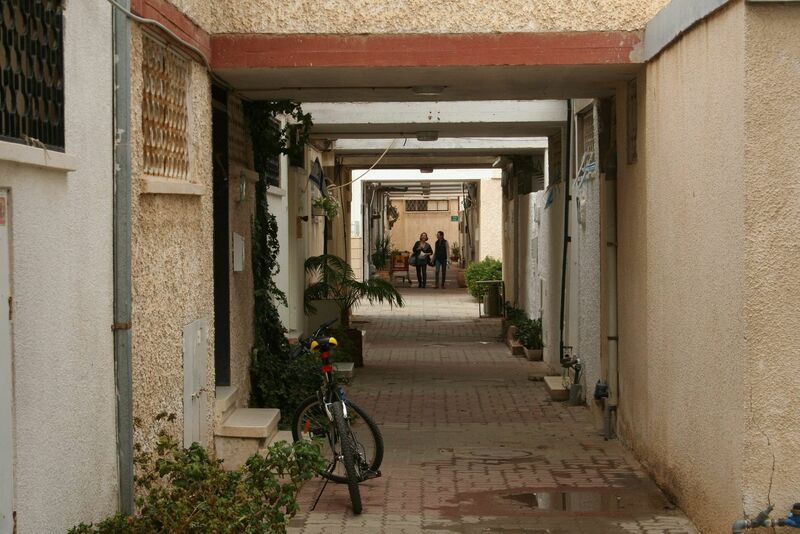 Many of the tonier neighborhood were eventually populated by nuclear scientists working at Dimona and professors at the University. Out in the harsh environment of the open desert, there is a sci-fi feel to the style, one of whose principle functions was to block and to filter strong direct sunlight. While Brutalism is often looked at from the outside, in the desert what matters most about this form of architecture is the refracted light and shade. For this blogpost I picked a soft photograph to show the way a bit of not very stunning and vernacular Brutalism can look like as a lived and livable space. At the so-called periphery of the country, like the city itself, much of this architectural legacy has been badly neglected, sorely in need of the recognition, renewal, and integration that might provide it a new stamp on life. This entry was posted in uncategorized and tagged architecture, Israel. Bookmark the permalink.